Retinoschisis is a disease of the nerve tissue in the eye. 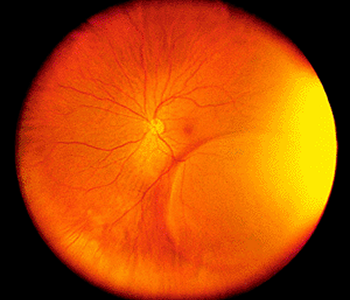 The retina, which consists of multiple layers of interconnected nerve and pigment cells, splits into separate layers, resulting in a loss of vision in the corresponding visual field. Retinoschisis is a disease of the nerve tissue in the eye. The retina, which consists of multiple layers of interconnected nerve and pigment cells, splits into separate layers, resulting in a loss of vision in the corresponding visual field. “Schisis” is derived from the Latin word meaning “splitting,” describing the splitting of the retinal layers from each other. If the retinoschisis involves the macula, then the high-resolution central area of vision used to view detail is lost, representing one form of macular degeneration. Treatment is often aimed at restricting any worsening of the separation so that it does not encroach on the macula. This type of retinoschisis is very common, with a prevalence of up to 7% in normal persons. Its etiology is unknown. It can easily be confused with retinal detachment by the non-expert observer and in some cases even the expert may have difficulty differentiating the two. Such differentiation is important since retinal detachment almost always requires treatment while retinoschisis rarely itself requires treatment and leads to retinal detachment (and hence to visual loss) only occasionally. Macular retinoschisis has only recently been identified as a form of macular degeneration in patients who are very nearsighted[myopia]. It is caused by incomplete separation of the vitreous gel from the macula causing splitting of the macular layers. It can be treated by vitrectomy surgery where the vitreous gel is removed from the back of the eye. Scar tissue pulling on the macula is then peeled from the surface of the retina with very fine instruments. The eye is then filled with a special gas bubble to help flatten the macula and hold it in place while it heals. You must maintain a constant face-down position after surgery to keep the gas bubble in contact with the macula helping to heal it permanently. Face down positioning is critical to the success of the surgery. Without proper face down positioning, the closure of the hole and improved vision is unlikely. Proper face down positioning is required for around 3 days, depending upon the nature of the macular hole and the doctor’s recommendation. Get more information on vitrectomy surgery. Retinoschisis can be caused by a genetic defect. The genetic form of this disease usually starts during childhood and is called X-linked Juvenile Retinoschisis (XLRS) or Congenital Retinoschisis. Affected males are usually identified in grade school, but occasionally are identified as young infants. X-linked Retinoschisis causes acuity loss in the center of the visual field through the formation of tiny cysts in the retina, often forming a “spoke-wheel” pattern that can be very subtle. The cysts are usually only detectable by a trained clinician. In some cases vision cannot be improved by glasses as the nerve tissue itself is damaged by these cysts. Very few affected individuals go completely blind from X-linked Retinoschisis, but some sufferers have very limited reading vision and are “legally blind.” Visual acuity can be reduced to less than 20/200 in both eyes. There is no effective treatment for X-linked Retinoschisis at this time.